Every year about this time, Tussock Moth Caterpillars invade our porch. Scores of them creep all over the porch rails and walls until they get to the ceiling. Once there, they weave a tough silken cocoon that irritates me to no end... and I'm a pretty live and let live kind'a guy. If I try and brush the creeping caterpillars off the porch, one of two things happen. 1) They survive the brush off and just come back. 2) They don't survive the brush off and leave a brown smear on my blue porch. So, that ain't a plan. Once they have constructed their impressively strong silk cocoons, even a pressure washer struggles to remove them. It usually takes 2-3 short blasts per cocoon to remove them. So, yeah, I'm not a Tussock fan. But this year, I got help. Maybe it was the mild winter or the extended drought, or both, or neither, but for some reason ... we have an extra abundant crop of Wheel Bugs (Arilus cristatus) this spring. 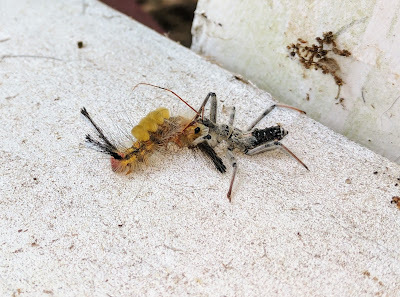 Wheel bugs are a type of "Assassin Bug" ... a group that specializes in ambushing other insects, injecting an innard-digesting enzyme, and then sucking the life out of their prey. Their nymphs are everywhere and man are they hungry...AND Tussock Moth is on the menu! Take that Tussock Moth porch defiler! 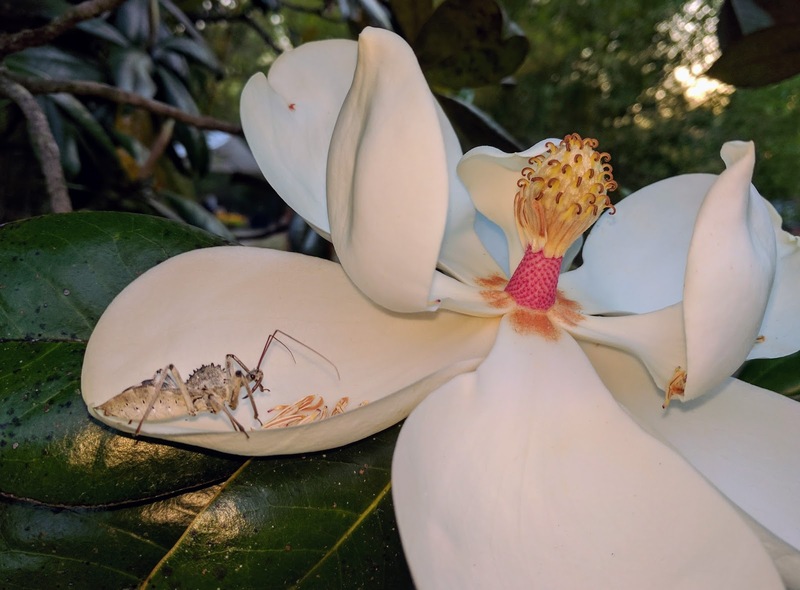 This is an adult Wheel Bug cleverly hanging out in a Magnolia blossom, just waiting to ambush some pollinator that happens by. If you look at the Thorax of this Wheelie, you can see the round, spiked hump that gives the Wheel Bug its name. A word of caution: Even though I like having these assassins around, NEVER make the mistake of picking one up. I did as a kid and I highly recommend NOT EVER touching one of these unless you enjoy the feel of a white hot needle being inserted into your finger and ... left there for a while. These guys aren't fooling around. Like any assassin, they are serious bugs on a serious mission. 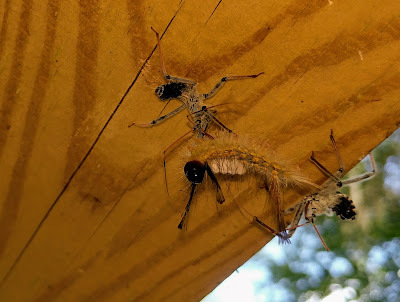 Here are two "sharing" a Tussock Moth. Always good to get help from the natural assassins. They do such a good job. Ooh the video is so cool! I was fascinated with the assassins who hung out on the zinnias I used to grow as a little kid. I fed them all different kinds of caterpillars. Between them and the ant lions in the sandy areas, and the tiger beetle larvae in holes out in the front yard, I was amused for free much of the time. Cool post. It's interesting to me what insects are pests in different parts of the country. Here, tussock moths are a PITA on my geraniums in fall. They apparently can eat anything, and do. Robin, they are my reward for not using pesticides around PFHQ 😎. Julie, they are a PITA here too beyond the porch issue. The Tussocks stripped the leaves off my pecan sapling. Anything that eats tussocks has my vote for "good bug". Yep, I picked one up when I was younger and stupider. Never again. But I love seeing them in the yard! Really nightmares to see this.